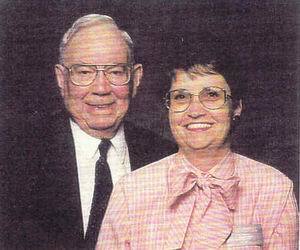 Sherman and Eileen were both born and raised in Salt Lake City, Utah. He chose to go into mining engineering as a vocation, and Eileen decided to become a school teacher. Their paths crossed about 1986 when the ward boundaries in their stake were realigned. In 1988 the two of them were married. Sherman’s first wife had died about 4 years before he and Eileen married, so Eileen married into a ready made family of seven fine children—3 girls and 4 boys and 25 grandchildren. Before marriage, they’d talked about a mission, and they submitted papers and were called to serve at the New Zealand Visitors’ Center. In October of 1994 they received a call to serve at Cove Fort starting in February 1995.